The Construction and Design Alliance of Ontario (CDAO) has expressed dismay with a new Toronto city bylaw that will allow the city’s treasurer to disqualify suppliers litigating against the city. Municipal officials say they will consult with industry representatives before implementing the bylaw passed on July 15, but CDAO chair Barry Steinberg, also chief executive officer of the Consulting Engineers of Ontario, wonders why the bylaw is necessary and has expressed concerns about the lack of consultation – and possibly severe unintended consequences – from the new rules. “On an absolute basis, without any qualifications, this will ban engineering firms and contractors from bidding and it essentially stops them from (starting) litigation because it interferes with them getting business,” Steinberg said. He said contractors and professional service providers won’t know if they’ve been disqualified until after they’ve gone through the expense of submitting their bids or proposal responses. “That’s a lot of work and effort for nothing,” and it could dissuade otherwise qualified bidders from responding – resulting in less competition for Toronto municipal work. Steinberg says if city is concerned about “frivolous and vexatious” litigation, presumably contractors with this sort of relationship with the city would be penalized under other provisions, including experience ratings, and so he wondered why the additional level of discretion to disqualify businesses from municipal work is necessary. “This authority is similar to staff having the authority to deal with poor performing vendors or unethical vendors,” he wrote. Steinberg said CDAO and the Broader Construction Association Consulting Group (GCAGC), an advisory group for Toronto with various industry representatives, hopefully will be able to consult with municipal officials on the bylaw implementation, but he said he is disappointed there wasn’t effective consultation before city council approved the new rules in July. John Teahen, president of the Greater Toronto Sewer and Watermain Contractors Association, said the city should be aware of consequences when it introduces this sort of discretionary clause. Steinberg says he hopes the city would engage in real consultation, and not just proceed with making rule changes and then putting on the consultation exercise for show. If there are problems with the bidding process, “let’s come up with a solution together,” he said. Proper discussions would “allow us to talk about what is frivolous and vexations” in litigation. 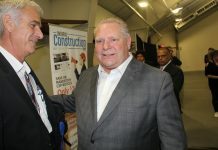 While associations cannot speak against their members, he said surely the number of contractors and service providers who would need to be covered by this bylaw provision, which cannot be resolved through other, existing methods, would be a “small number” – and why is it necessary to taint “the entire industry with the same brush,” he said.